Throughout my pregnancy, I was told to expect a small baby. I'm 5'3 when I stand up really straight, and generally weigh around 50kgs, so I certainly understand that being on the smaller side doesn't mean being unhealthy. Still, to realize that in theory is one thing. To give birth to an underweight baby is another. Those words '2nd percentile' felt like a personal failure. I wondered if I should have eaten more protein, or iron, or less sugar, or... the list was endless. It didn't help that I was told to compulsorily feed eM every 2 hours till she reached at least the 5th percentile for weight. She was a foodie from the start and we'd no trouble latching her on, but the problem was keeping that teeny tiny fellow awake long enough to eat. I'd set an alarm, and call in reinforcements to prod her and tickle her as I tried to coax her awake. All the while, I felt ridiculous, and desperately wanted to just go back to bed myself. My journals from that time contain incoherent rambles, I was exhausted to the point of sleepwalking. I understand these were exceptional circumstances and maybe eM wouldn't have gained weight normally without that extra effort. That said, ever since her weight increased to a medically acceptable limit, I've let her decide when and how much she wants to eat. Some times she slept through the night, other times she ATE through the night. If I'd watched the clock rather than my baby, I may not have offered enough at growth spurts, or obsessed when she didn't eat. But as it was, frankly, I let her decide and didn't think twice about it. Common sense showed me she was energetic and engaged when awake, and the monthly health checks reassured me that she was, in fact, gaining weight consistently when left to her own devices. By the end of the first month, she'd climbed to the 50th percentile for weight (isn't breastmilk awesome?!). This gave me the confidence to trust her instincts when it comes to food. So I took the same approach to introducing solids - my job as a parent is to offer healthy food at regular intervals, roughly every 2-3 hours. Deciding what and how much to eat is up to her. Some days she eats as much as me, other days she does upvas bhojan 😂 But no matter what, she decides, and I don't keep tabs. Since she's always eaten the same food we do, there's no wastage, or tension from looking at all of 'her' food left over. We eat together, and I focus on my plate rather than hers. After all, whether at 2 years old or 30, we each know our own bodies and appetites best. Baby led weaning, as this approach is called, is also a matter of convenience. It's usually just the two of us at home... and though I may not get to sleep when the baby sleeps, I definitely prefer to eat when she eats! This style of weaning gave me back some time, while providing my toddler with some much-appreciated independence. At 6 months, she was handling all her finger food well. By a year, she was making a bit of a mess but essentially able to get daal rice and so on into her mouth. All this while she had no teeth, haha. Even so, she managed to eat everything we did, albeit without salt, chilli and honey. She thoroughly enjoyed Sri Lanka, where we went for her birthday - string hoppers were a favourite dish! Over time, she's travelled around the world discovering local foods with as much enthusiasm as her mother. I've never considered hiding or disguising her food in any way. She's told what's available; and she can either eat it or not. There are no convenient treats available to bribe her with if she decides she doesn't want to eat something. After all, she doesn't eat to please me; she eats to fill her stomach. Which means that when she's hungry, she'll come and ask for food herself. Yes, that food may be curd or a fruit rather than a full meal. But that's her choice, and I leave it up to her. After all, haven't we as adults skipped a meal because something just didn't feel appetizing? We make up for it later, and so does she. Her health checks continue to reassure me that she knows perfectly well how much food she needs to grow. If you're interested in learning more about baby led weaning, I highly recommend joining the Facebook group Baby-Led Weaning India. 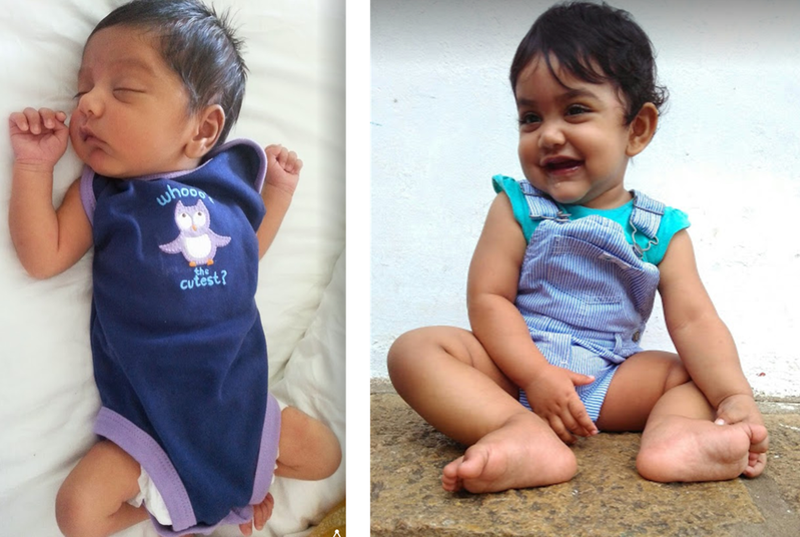 If you weaned your baby traditionally and want support as you transition to letting them feed independently, do check out Traditional Weaning India. The admins of both groups are very helpful, and the groups have a wealth of resources available. 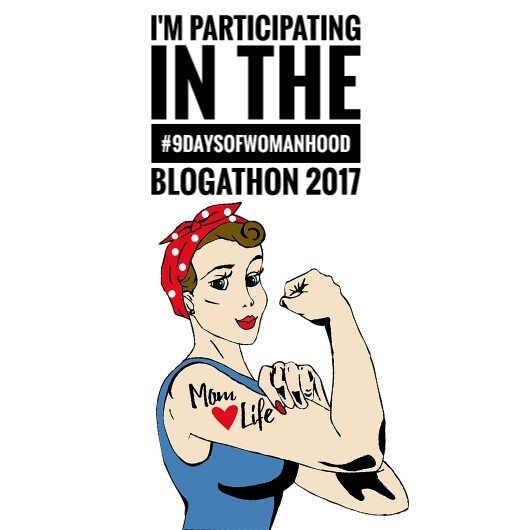 It's the final day/prompt for #9DaysofWomanhood which I've been celebrating with 24 other bloggers! I've had a blast playing along, reading others' takes on the prompts, and, most importantly, finding new blogs to follow. This has been my first blogging challenge, and I couldn't have asked for a better one. Yet, if I thought about describing my mom or daughter or friends as goddesses, it made me snort with laughter. Anything I wrote sounded waaaay over the top and filmy. I guess it doesn't help that the goddesses in most religions are absolutely flawless, and the women I love are their perfectly imperfect lovable selves. And then, right as I was falling asleep, one woman's face came to mind. It's a face I've seen a lot of lately, and it instantly evokes Goddess Kali. If you've seen her, or experienced her energy, I’m sure you feel the same way. But let me backtrack and start at the beginning. This week initiated the last 30 days of my being 30 years old. It’s been a good year, filled with tons of little indulgences, from heavy desserts to cheesy delights. I’m a foodie, and I make no apologies for it. I’ll never diet, but even so, this year has been a particularly lazy one. Especially since eM now walks and cleans up after herself, I haven’t exactly had any exercise at all. I figured I’d end year 30 on a high and do the only workout I’ve ever managed to commit to – Jillian Michaels’ 30 Day Shred. The Shred is 25 minutes of alternating strength, cardio, and abs, in 3 difficulty levels, over a month. All it needs are a couple of dumbbells (ahem – not including this exerciser, who sometimes feels like a dumb belle herself when doing push ups). It's perfect for people like me who get bored easily. The time's jam packed with constantly changing routines; there's no time to think in between the instructor counting you down, and shouting you on. … And so we come to the instructor, Jai Ma Kali, Jillian Michaels maiyya. She is in frighteningly good shape, especially given she’s way older than me (she's 43, whaaat? Does the woman in the image there look 43?!). People who’ve attempted the Shred can tell you she’s rough, tough, and allows no excuses. She’s exactly whom you’d want on a battlefield, either fighting your side, or pushing you on. When you watch her do her bicycle/reverse crunches, it honestly feels like she has 4 arms or 10 arms, as compared to my 2 paltry chicken wings. Her motivational quotes on not quitting and not giving up invoke the image of Kali in rage. If she were holding up a head instead of a dumbbell, it would be mine. The woman is a sheer force of nature, and she urges me into becoming one too! Behind the formidable exterior and the constant shouting, though, lies an angel of mercy – Kali is the destroyer of evil forces, and Jillian Michaels destroys fat. Take it from me. I’ve done the Shred once or twice a year for the last few years, mostly when I felt I needed an energy boost after a lot of sedentary desk time. Depending on your fitness level, you’ll sweat a river, pant like a dog, and have your legs turned to jelly; either on day one or on day twenty one. But at some point, your muscles will scream for mercy – and, like Michaels mata says, that’s when change happens. That’s how you destroy evil fat cells and get. back. into. form! In all seriousness, I was in perfect health right after I delivered eM, and ate decently + walked with her a couple of times a day till she turned one. I put on 16kgs while pregnant, all of which was baby and fluid, so it came off in a month (I exercised throughout pregnancy and soon after). But when eM started walking, I... stopped. Then she started doing even more by herself, which left me doing even less. Lately I've been feeling sluggish and in need of some exercise. So, of course, hello Shred! The short duration, easy adaptations, and lack of special equipment make it very mom friendly (though I suggest consulting an expert the first couple of times you do it). I'm sure it aids in weight loss or loss of inches, but for me, the biggest benefit is that it ensures I drink more water and feel full-on #JaiMaKali myself! It's a pick-me-up I highly recommend to those wanting a slight kick. The first year of eM's life truly drove home that cliche about the days being long but the years being short. That year, my god, it had the longest days I've ever encountered. I watched the clock constantly, feverishly, hysterically. I literally counted down the days till she'd hold her own head up, start eating solids, and just... stop *needing* me so much. I rolled through most of it on auto pilot. They say you forget the pain of delivery once you've had the baby. I say you just as easily forget those initial hellish weeks - when days blend into nights, and it feels like life will never be normal again. For this reason, I'm doubly glad that I journal-ed it all, uncensored. I think that if eM chooses to have a baby, she deserves the full unvarnished truth about just how bloody hard it can be. That's the story that the adorable pictures on Instagram don't tell. I don't want her thinking I was a great mother based on my easy delivery story or my choosing to breastfeed or whatever else. It's easy to look at the the advice I gave others on babywearing/diapering/baby books, and think I had it all figured out. The truth is, I floundered through that first year, and it caught me entirely by surprise. As I mentioned before, I haven't yet decided if I'll share the journal I wrote offline for eM on the blog - I'm too aware of an audience reading this. Instead, for now, I'm sharing the other side of the coin - glimpses of the first year of parenting, in a retrospective nutshell. It's a lot easier to share, and no less true. That's the thing about parenting, and especially that first year - the highs are high, the lows are low, and there's almost no in-between where you can just catch your breath and get used to it all. It's really only once it passes that you realize - oh. That kind of had its amazing moments. And man, we made some awesome memories! The base - a purple fleece, was the one eM was first wrapped in. 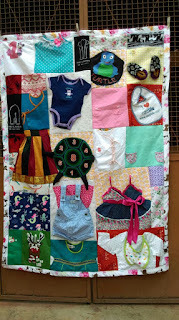 It was my very first pre-baby gift from the girls I was supposed to meet for bandi dosas on the night when eM was born! The base was reinforced with a blanket from a former work colleague, whom I bumped into again when we both attended a prenatal yoga class. We quit the yoga, and have shared many a sinful dessert together since instead! Here's to making new friends and rediscovering the old. There's nothing like having a baby to redefine your relationships. Nearly every friend I made or reconnected with in that first year gifted eM something which made it on to the memory quilt. Then there's the kurta I had eM in because there was no time to change into a hospital gown. And the hospital gown she was first put in, an impossibly tiny shirt which was still way too big for our low birth weight baby. The first baby clothes she was gifted, which I put her in with trembling butter fingers, convinced I was going to break her. There's the Carter's newborn sized onesie I tempted fate with and bought before she was born. I took pictures of her in that onesie every single month until she turned one (it went from being an oversize onesie to a too-short crop top, but that thing stretched for all it was worth!) As she grew older, there, too are her first pattu pavadai from her perimma. The dress she wore the first time we attempted a dinner date out, also the one she wore when she first stood up (and promptly plonked back down on her bottom, looking very pleased with herself). Her first pair of soft-soled Skips, which she barely wore, preferring to go barefoot. The outfit my uncle gifted her, which she wore for her first flight journey to meet A's grandparents. There's even the dress that someone sold me with a very obvious tear in it and refused to take back - a reminder of how mom dynamics sometimes work. And, on the other hand, the surprise first birthday shirt another mom I barely knew made for eM just because. Ah, moms. Mom friends, mom frenemies, mom rivalries. They're a topic for a whole other post, if not a novel. Milestones, relationships, battles, victories. Every single square inch of that memory quilt has a story to tell, if not several. It is, in its own way, just as effective a journal as the one I wrote eM. I can't wait for the quilt to arrive so I can start telling her about the first year of her life. PS: This quilt retails for 1500 + GST + shipping, if you're interested. Prices may vary depending on the size and materials you provide. This post is part of #9daysofwomanhood which 24 other bloggers + I are celebrating throughout Navratri. You may have come here via my co-host Uttara's post introducing me, do stop by her blog if you haven't yet. Also check out Anubhuti's take over on her blog. I, along with 24 other bloggers are celebrating #9daysofwomanhood throughout Navratri. I've never felt more fierce than during my labour, so this is an apt story with which to celebrate womanhood. Thanks for setting the stage for me Uttara - I loved your blog sharing your experience! The gynac and I both stared at the machine monitoring my contractions. I'd come in for my regular 40th week check-up, and she'd suggested I check. "You really don't feel that?" she asked. "I feel... something," I said. Mostly the need for chocolate and a long walk, but the machine told me I was supposed to be in pain. "You're in early labour, and the contractions are pretty intense. If you're not in pain, I guess..." she trailed off. "Maybe you could come back later. Be prepared for the baby to come soon." Uh, no. By now I'd realized that my doctor was the kind who preferred to be safe than sorry. She'd been saying the baby could come any day now for the last few weeks - thanks to my blood sugar being high and the baby's weight being low. But I'd continued to do my yoga, eat well, and hope for the best... and here we were at week 40. So you can excuse my taking her proclamation that I was going to have a baby soon with a pinch of salt. The next two days flew by as usual. I walked 2km twice a day, shopped a lot, and cooked + cleaned up the kitchen after myself. My mom tried to remind me that I was technically in labour, but I couldn't feel much more than standard PMS. After I wiped down the kitchen on the night of Feb 7, I SMS'ed my friends to make sure we were going bandi-hopping the next day. 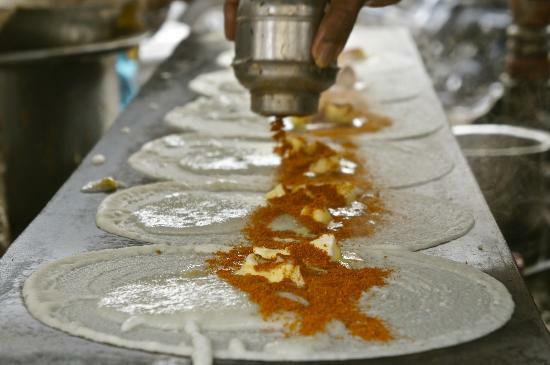 Hyderabad is famous for its street vendors who sell dosas from 2am onwards. By 5am, they're sold out. For some reason, I hadn't made it to a bandi yet, and I was itching to go visit one before I had the baby. "Just hold off for one more day," I told my belly. My due date was February 8, but I really wanted a Valentine's baby. I was hoping I could be like most other first time moms, who typically have their babies later than the due date. "Are you having contractions?" he asked. My mom had tipped him off that I'd cut my evening walk short by a little bit. "No, I just need to poop. I'm going to Govind's bandi tomorrow morning, ok?" I said. I shifted to the loo, but (excuse the TMI), I just felt massively constipated. I tried to figure out my book again, but couldn't. "Should we go to the hospital?" the husband asked. "This is nothing!" I said, convinced by all the movies I'd seen and the reading I'd done that the pain would be a whole lot worse. "They'll send us back home. We can't go until the contractions get much closer. I'll go eat my bandi dosas tomorrow, and then we'll go to the hospital later." (Yes, priorities, dosas over deliveries). I downloaded a contraction timer anyway and tried to time them. They made no sense at all. They came close together and lasted a long while, then they spaced themselves out a bit, and lasted for a shorter duration. I was convinced they'd go away if I could only use the loo. Either way, they could certainly wait until 7am, by which time I could have eaten that dosa I'd been longing for. "Is it paining?" the husband asked again, at around 3am, when he woke up to find me still on the loo. "No! I just want to sleep!" I said, trying to figure out what the hell my book was saying. Little did I know I wasn't going to sleep though the night again for the next two and a half years (and bloody counting). At around 4:15am, I realized I wasn't going to get my bandi dosa after all. I figured I was going to be that woman who went to the hospital and was told to go back home because this pain was nothing. Still, I figured I may as well go, mostly because I wasn't able to sleep anyway, and my husband was starting to get annoyed at my denial of any pain. The Uber driver was petrified I was going to have the baby in his cab, and sped through the nearly deserted roads. In retrospect, I'm lucky I didn't have the baby in our loo. We barely made it to the hospital. A duty nurse inspected me casually... all my research about long first-time labours and contraction intervals made me so sure I wasn't experiencing the real thing, I was quite calm. To my surprise, she said, "Don't move! I'm calling the doctor." My gynac made it over in ten minutes flat, despite it being a Sunday. Next thing I knew, the room was full of people, and they said I was going to have a baby very soon. I figured they were exaggerating to make me feel good about myself, I was still sort of embarrassed that I'd come all the way to the hospital before I was in 'labour proper.' I asked if I could please use the loo, and the doctor said no, because what I was feeling wasn't poop, it was the baby. That's probably when I realized this was actually happening. The next five minutes were a blur. My waters were burst with a shepherd's hook, and the baby came out in record time. So fast, in fact, that I had to have an episiotomy so that I wouldn't tear brutally. Honestly, those episiotomy stitches hurt more than the labour. My doctor kept telling me not to tense up, and reminding me that I'd barely felt labour. There's no comparison, this was so much worse! I was tempted to ask for an epidural. Somewhere in there, I managed to ask if it was a boy or a girl. I'd won the birth lottery of my dreams, it was a girl! I can't get over how lucky I felt in that moment; to have not just a healthy baby with an unfussy delivery, but also a girl. It's everything I'd ever wanted. There were tears from my gynac, who couldn't believe how quickly it all went. Yeah, me neither. 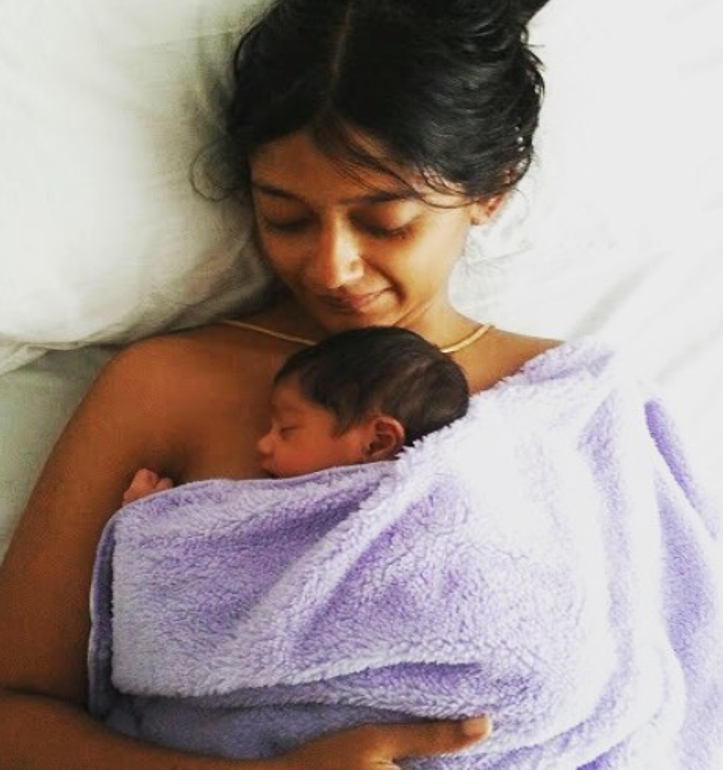 A few minutes later, I was blissfully feeding my daughter, and that's how I became a mom. Bang on my expected due date, with irregular contractions and no water bursting. Sometimes all the reading you do doesn't prepare you; you get to be the lucky exception to every first-time-labour rule. Oh, and I'm still waiting to go bandi hopping (or get a full night's sleep!) a good two years later :D If you've a labour story to share, I'd love to hear it! You can check out my co-blogger Anubhuti's story for today here. Back when I was writing about my pregnancy and eM's first year of life, I wanted to be anonymous. I kept it all offline. Now I'm considering moving those entries to the blog so it's all in one place. Maybe I will, maybe I won't... but for now, it gives me immense pleasure to share a bit about my pregnancy as part of #9daysofwomanhood. I, along with 24 other bloggers are celebrating this theme throughout Navratri. Thanks for setting the stage for me Uttara - I loved your blog on the prompt for today - 'My Pregnancy'. Let me set the record straight - we'd been not not trying for a while. In layman's terms that amounts to wanting a baby, but not necessarily thinking we'd have one right away. The odds weren't exactly in our favour. I'd been travelling solo through Europe for a while, and I met the husband in London after a couple of months apart. Next thing I knew, I was downing three helpings of sticky toffee pudding (I'm not a desserts person), and not feeling remotely motion sick, which is my default mode when I'm travelling. While I felt great, it didn't occur to me that I could be pregnant till AFTER I'd drunk my way through Scotland's whiskies. Oops. It first occurred to me that I could be pregnant when we were in New York on a cruise my travel company had sponsored. It killed me to lay off the wine, but I'm glad I did! My period usually comes like clockwork, so I figured I'd wait till I'd missed it to take a pregnancy test (why waste money and optimism, amIright?). I waited till I was two weeks overdue and then picked a cheapie test because I still couldn't quite believe I'd get lucky enough to actually be pregnant. I didn't even have to wait very long, the test said I was unequivocally pregnant. I called my family doctor up for an appointment straight away and then waited patiently for the husband to come home. His face was priceless, especially since he'd just finished telling me jubilantly about quitting his job. "Should I take back my resignation? Is this test real?! Are you sure?!!!" ... So yes, the timing wasn't perfect. But when is it ever? Having a baby turns your world upside down at the best of times. We went ahead and travelled extensively through Canada for the next few months, as we'd planned. We didn't even tell our parents the news till we came back to India, because we knew their idea of a sensible first trimester doesn't include climbing up glaciers. And I wouldn't change a thing about that madcap first couple of trimesters, when I felt healthy, happy, and like I could conquer the world. What's your pregnancy story? You can check out my co-blogger Anubhuti's take on the prompt for today here.